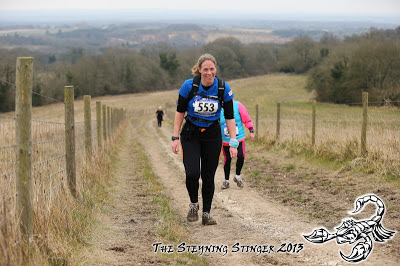 Everything came together today for a great run over the South Downs. I changed three things since my last marathon: I cut out caffeine a week before, I started taking Athletic Greens daily and I've been continuing to do two quality sessions with Trent Park RC each week - usually one on the track and one fast (for me) Thursday run. I suspect the faster runs have made the difference but I will be monitoring closely to see how much effect the supplement and the lack of coffee has had. On Saturday, C and I drove to Brighton to visit her family, stopping off on the way at the Ditchling Tea Rooms (excellent cakes and friendly staff) and then the top of Ditchling Beacon for a quick walk - nothing too strenuous as I could still feel Thursday night's fast 4 mile training run in my legs and wanted to take it easy for Sunday. Sunday started off chilly and overcast and stayed that way for most of the day. The sun did appear eventually, but only on the drive home. A nice early start for this one at 8:30am. 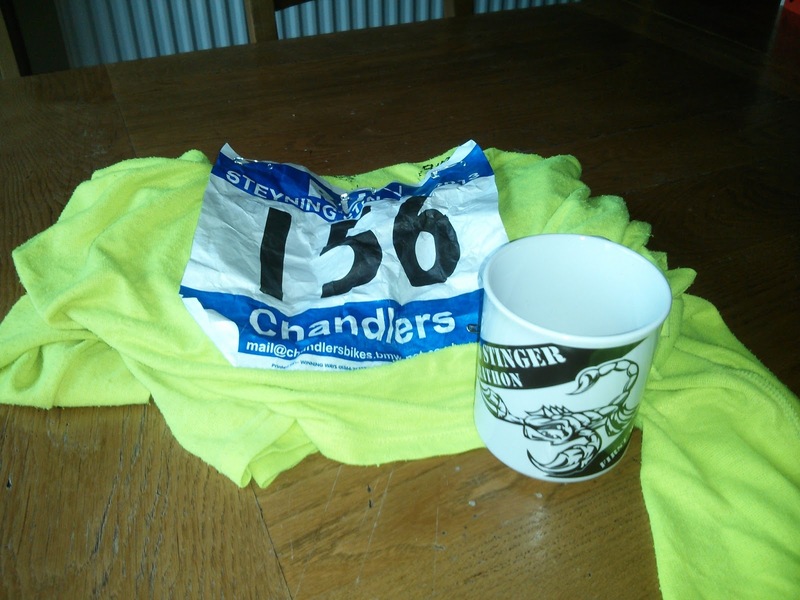 C was running the half on the same course, setting off at 9:00am so I waved goodbye and set off at a brisk pace. The first few miles felt flattish but the profile actually shows steady uphill for 3 miles! I felt great for four miles, then a quick descent through some woods ended in crossing a bog. People were losing shoes in the mud. 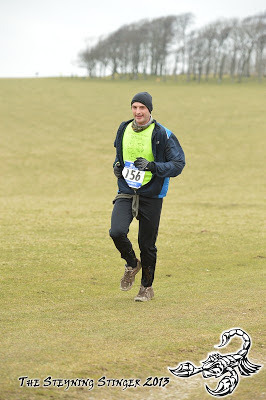 I managed to keep my feet in mine, but the extra weight of the water and mud in my shoes sapped my energy for a while. The Steyning Stinger is so named for the four climbs, or "stings", on the course. The first took me from four to six miles, where I was mostly walking, along with everyone else. About the only exception was one of the photographers who was encouraging us to run for the camera. I added my buff and soon after a hat after the summit for a two mile descent. Having dried out from the boggy field, conditions underfoot were perfect for distance running - spongy but firm grass or earth trails for some of it, flint tracks for the rest, with very little tarmac. C on the first proper climb. Another two mile climb followed, this one was pretty bleak with a long view of the ascent ahead, grey skies and a chill in the air, but I felt great at the top and cruised down the following three mile descent, passing plenty of other runners on this section. Grass gave way to a flint track and then earth as two turns led to the inevitable climb back up the hill I had just run down. I felt good on this ascent, being passed only by a very quick runner in a SDW100 tshirt, who joked that this was mere speedwork after the hundred. I wasted no time at the checkpoint at the top, showing my number, and grabbing a cup of water without stopping to rest. This marathon was well supplied with eight checkpoints. I took my usual mix of nuts and sultanas (much cheaper than gels!) and took a quarter of a Gu Brew Electrolyte tablet with a cup of water at every checkpoint. These tablets work really well for me, but in the second half I was still desperate for a drink coming in to every checkpoint, despite it being so cold. The course was easy to follow with plenty of marshals and direction markers in all the right places. The next mile and a half, all downhill, to the next checkpoint, flashed past, followed by a loop where I was now out on my own, running into the wind. I was still feeling good and starting to realise I was on for a decent time. I knew that if I could just maintain my pace of just under 6 minutes per kilometre then I should get about 4:12 overall. On the way out of the 2.5 mile loop I started seeing runners who I had passed not that long before. This motivated and surprised me, to think that so much gap had opened up. I was now really on my own for the hardest part of the course. The climb from 22 to 23.5 miles was boring and windy with nobody in sight behind or in front of me. But as it levelled off towards the final checkpoint, I picked up, growing in confidence that I'd finish in under 4:10. 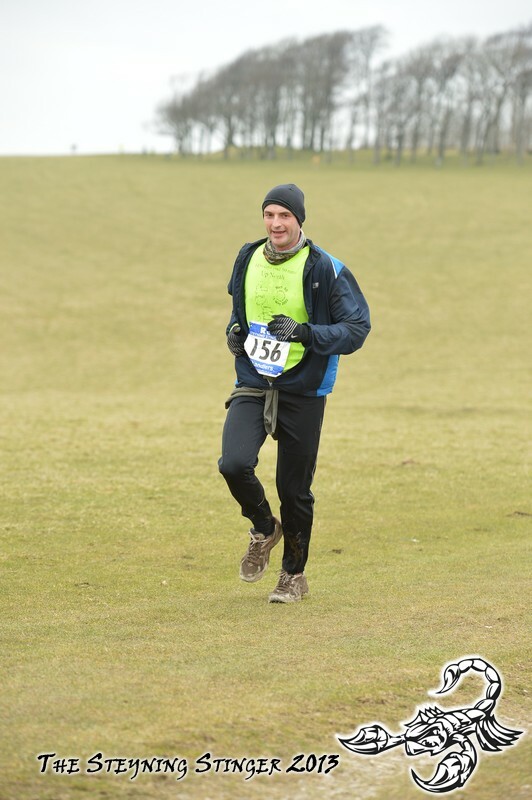 After my last drink I hammered down the steepest descent of the race through some woods, passing a couple more running and thinking it was downhill all the way to the finish, only to be caught out by a short, sharp ascent coming out of the trees and around the edge of a field. I suffered on this last mile, having to keep stopping to stretch out cramp in my calves, before running the last half mile, overtaking a few more runners to finish in 4:06:50. C was waiting at the finish, having completed and enjoyed her half in 2:23. There was even a fried breakfast provided for everyone, and a souvenir mug. I felt overwhelmed at the finish, having surprised myself by running much quicker than I had expected. This was a great way to complete my 44th marathon. I felt good almost all the way round and this is my fastest hilly marathon to date. All my faster marathons have been very flat (London, Kingston upon Thames, Milan, Cambridge Boundary, Boddington). So this bodes well for a good time in Telford next weekend.